Has anyone ever experienced this problem? 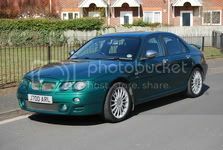 I have a 1.8 turbo petrol Connoisseur SE on an 03 plate which I have owned for about 14 months. During the last month on several occasions the temperature gauge has dropped to cold without warning. When this happens the cooling fan is on constantly and curiously the radiator expansion tank is cold. I can remove the top and there doesn't seem to be any pressure. If I turn the engine off for a couple of minutes the fan stops and on restarting the engine, the expansion tank starts to warm up and the temperature gauge returns to normal and reads dead centre. There is no logic to when this happens. I can go on a 100 mile run without any problem, but then on a short run to the local car wash, the symptoms appeared while the car was idling as it was being cleaned. The car isn't using any coolant. I hope somebody is able to suggest what might be causing this problem. Many thanks in anticipation of your replies, Alan. Sounds like a sticky thermostat to me and as they are relatively cheap to replace, I would start there! Thanks for your reply to my problem. Your answer has also been suggested by a member on another forum. However, I have also been advised that nine times out of ten the problem is related to the wiring into the temperature sensor or the temperature sensor itself. I have booked the car into my local garage next week for them to investigate the problem further.